Nebulisers deliver asthma medicine directly to the lungs and airways and are often seen by asthma patients as a more effective piece of equipment than inhalers. However home nebulisers are big and bulky and if you live an active lifestyle or travel a lot they’re not very useful. There are now some excellent portable nebulisers that can deliver the benefits of an at-home nebuliser. These are great devices to help with your asthma control when you are travelling or away from home and want an asthma delivery system on hand. What to look for in a portable nebuliser. The main benefit of an ultrasonic nebuliser is the speed at which it delivers the medication. It can take a mere 5 minutes to set up and administer compared with nearer 15 minutes for a compressor model. So if you’re on the move or need a quick treatment at the office, an ultrasonic nebuliser is a good choice. That said, there are a few portable compressor models that also offer fast treatments when away from home. The InnoSpire Mini for example delivers 2.5ml medication in as little as 6.9 minutes. Also, some portable nebulisers don’t have the power or capability to deliver certain medications. Some paediatric medication, for example, may not be delivered as well with an ultrasonic as with a compressor nebuliser. Others need filter pads for nebulising antibiotics or inhaled steroids. Best to ask your doctor to advise which method will best deliver the medication you are prescribed. User reviews can be another good place to look for this information. Portable nebulisers are all battery powered, but there are lots of different options to consider when purchasing one. Some units run off of standard AA batteries, which can be replaced conveniently when they run low. However, units that run off of an interior rechargeable pack tend to have longer battery life. In-car chargers can make rechargeable battery packs almost as convenient as AAs or other standard batteries which is useful when travelling. 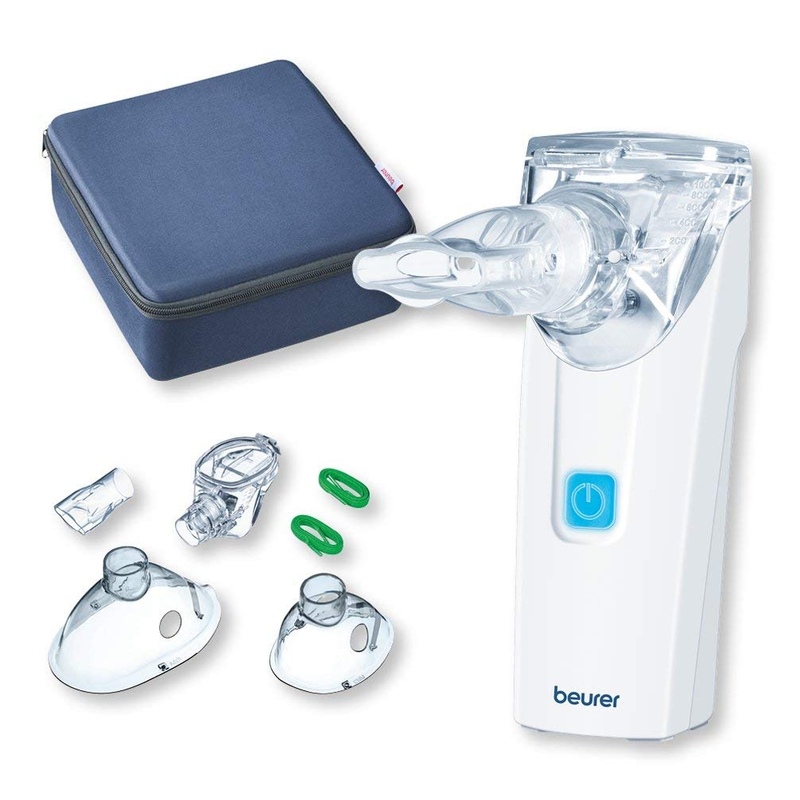 The Beurer IH55 Portable Nebuliser is an ultrasonic compressor nebuliser with a mains power cable as well as the option to use 4 AA batteries. Think about how often you will be using your portable nebuliser and in what conditions in order to decide what kind of battery life and recharging options you need. There is a lot of variety in the size and portability of different units although they are all are a lot smaller than at-home table top options. Some of the smallest and lightest can actually fit in a pocket. So another thing to think about is how often you will use your nebuliser and how you will need to store it when travelling before deciding on the size. To keep your nebuliser delivering medication effectively it must be scrupulously clean. How easy it is to do this should be an important factor in your decision to buy. If you are only going to be using your portable nebuliser as a backup or infrequently when you travel, cleaning it may not be so big an issue. But if you intend to use your unit daily at work or whenever you are away from home, you will want to make sure you get one that is easy to take apart, clean, and put together again. Reading user reviews can be helpful here. Over time you may need to replace your nebuliser’s mask, drug chamber, air line or filter so check if the portable nebuliser you buy has a ready supply of spare parts. Also ask your retailer about guarantees and repairs.